The Gee Bee R2 racer is one of those planes most everyone loves but hates to fly. With the big round body meant to house a large radial engine and just enough wing area to keep it in the air it can be a handful to fly. Enter E-flite and their new AS3X technology to tame down the beast and make it in a micro fly anywhere size. The release date is late December of 2011 so we might not see it under the christmas tree but hopefully by new years we’ll be tearing up the ball parks and indoor arenas with this new micro plane from E-flite. Check back for my take on this plane once it’s released. 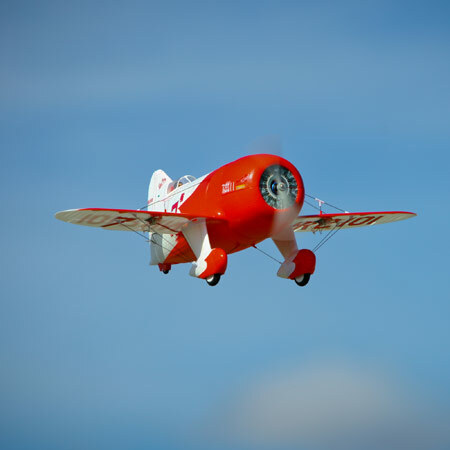 Gee Bees competed in all the popular airplane races of the Golden Era of aviation. These highly engineered, teardrop-shaped, super planes required a skillful hand and perfect circumstances, but with the right pilot, they ruled the speed course. The UMX Gee Bee R2 is yours to groove through the skies just about anywhere because it features specially tuned handling more in common with a Sunday sport model than a short-coupled engine with wings. The awe-inspiring UMX Gee Bee R2 replica offers handling so remarkably smooth, you’ll want to fly this authentically scaled model every day. Its built-in, specially tuned, AS3X System invisibly helps you enjoy the kind of silky handling and outstanding control you always wanted from a conveniently sized RC model, but never thought possible before now. And you get all the benefits without having to spend a lot of setup time. No special programming is required. Just charge the included Li-Po battery, bind to a basic DSM2™/DSMX® airplane transmitter setup and the UMX Gee Bee R2, enhanced with the AS3X System, will instantly offer you the best flight experience possible.